A glimpse into my dream wedding! 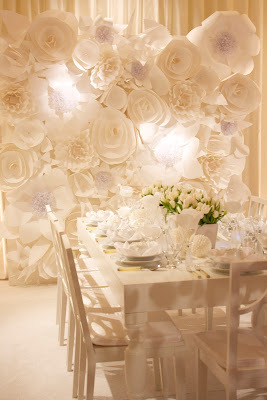 Here it is, the epitome of the chic white wedding. I dropped by the wedding fair at the Four Seasons yesterday and left insanely inspired by this wonderfully produced table by our friends at Hartmann. 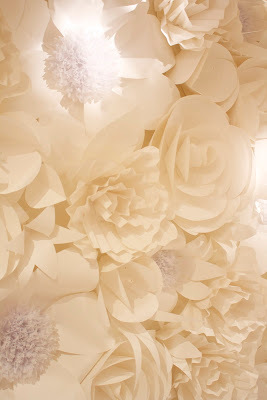 Needless to say, you can expect to see a blog post with my own version of this gorgeous flower wall. Hartmann is one of the best and biggest event lighting and furniture rental companies here in the Bay Area. Their catalog is impressive and is a wonderful resource. They can turn any designer's vision into reality with the amazing selection of items and custom lighting options. 1. Lots of texture. By adding a lot of different elements (soft, pattern, solid, hard, fuzzy, light, shiny, round, square,etc.) in the same color you work the eye into a frenzy and create movement. 2. Layers. Using chargers, artfully placing a napkin under a bowl, adding some flowers on a goblet, and creating a centerpiece with high and low elements creates layers that add more dimension. Using mis-matched items, or mixing vintage and modern elements creates layers and lots of interest. 3. Create focal points. The spectacular flower wall by the table draws the eye through the table and up towards a focal point, creating interest. One or two of these focal points throughout a space helps define areas and break up the monotony of the color scheme. 4. Use the unexpected. 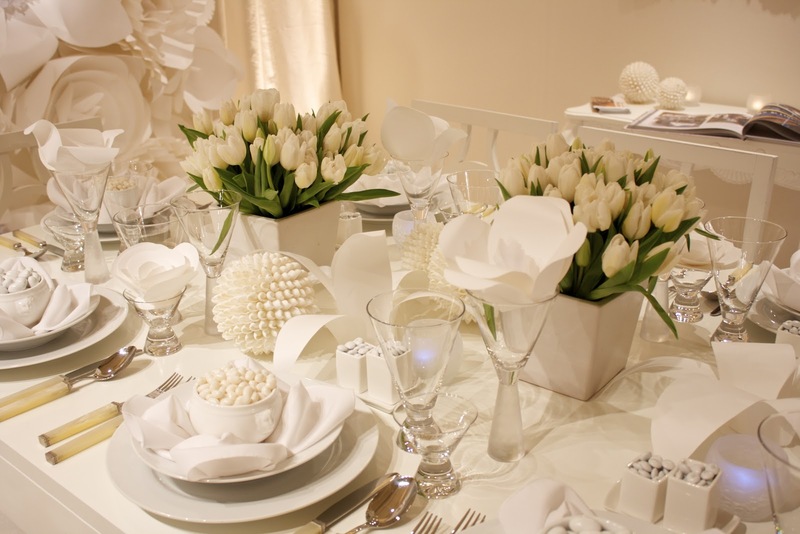 The white lacquered table doesn't have a table cloth. It doesn't even have a runner or place mats. But, it works. By showcasing the table's details and features, you're emphasizing more texture and scale . This table combined with the sculptural chairs create a wonderfully relaxed look that counteracts the formality of the all-white scheme. 5. Great lighting. I can't stress enough how important lighting is at an event or in a home. You can have the most amazing layout and furniture pieces, but without great lighting options - it could end up looking dull. Highlight focal points and create interesting shadows. 6. Last but not the least, don't forget the floors! This set-up looks so perfect because everything - including the floor is white. You have to think about how your vision will look from bottom to top, and anything in between. Can you imagine what this would look with bright red carpeting?